So hopefully you’ve jumped on the ban wagon with us and started a four day Daniel Fast. Yesterday, I wrote a post with a four-day menu and some links to recipes to help you start. Also, I’m really active on facebook, twitter, and google+ with verses, funnies, and encouragements throughout this process. Plus, there are some others fasting this week that you could get encouragement and advice from if this is your first time. Today I just wanted to go over a couple things about the fast… a couple of encouragements, if you will. 1) A Daniel Fast is about communicating with God. Sure, it’s also about super healthy foods, but really, you are eating with restrictions in order to clear your mind of this “distraction” of the world: food. By eating super healthy, you are feeding the body just what it needs while allowing your mind to revert away from the lure of chips, candy, cokes, breads, steaks and the like and refocusing that attention to God. 2) Because of number 1, I encourage you to not get swept away by all of the rules, or you’ll end up missing God because you are so focused on the food and on the rules about the food. Keep it simple: Is it a veggie? Is it a fruit? Is it a nut? Is it water? If it answers “yes” to any of those things, then eat it. If it answers “no”… then don’t. And spend the time you would spend worrying… spend it on prayer. spend it in reading the Word. spend it in service to Him. You see, Daniel did this fast because he’d had a vision of the future that was horrible. So, he went into mourning and prayer. He didn’t eat rich food, meat, or drink wine… he also didn’t lotion up with his most recent Bath and Body Works selection. Ha! So, I think over the next four days, it would be good if you sorta came up with a theme of what to pray about with God. It can be something you are mourning: a broken family relationship, a friend in difficult times, the state of our country, hunger in Africa, the human traffiking issue, your own sin or struggle with gluttony. Whatever it is… during those times of hunger or during that moment when you have to resist “rich food” with a bit of self-denial… use those times to pray to God about your issue. 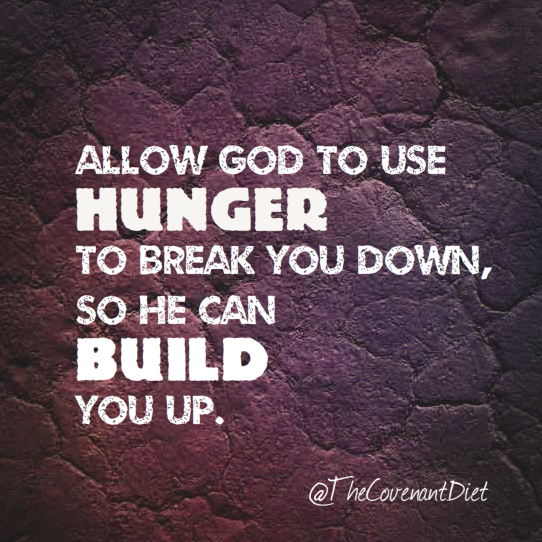 Allow God to use hunger to break you down a little bit, so that He can build you up.